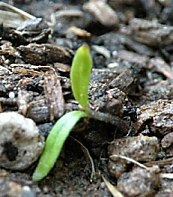 Tomato seeds can be planted directly into the ground or sown indoors. Many people find that sowing indoors is the easiest and promising method, depending on preference and climate. Tomatoes rely on warm weather conditions and grow best when the soil is above 60 degrees F. After the soil is prepare, dig holes that are about 1 inch deep and place 2 seeds in each hole and cover with the soil again. Water the soil enough that it becomes very moist and when the plant begins to grow up to about 7 inches in height, you may want to tie the stem to a support stake with twine. Sowing seeds indoors tends to have a higher growth rate which is why many gardeners use this method. Fill containers that are about 3 inches deep below the rim with a seed starting mix, moisten the mix and let it drain. Plant one or two seeds per pot and cover the seeds with compost or potting mix and moisten lightly. You should place the container in a warm and dry location where the plants will not experience any drafts. In about 7-10 days, the seedlings will begin to grow whether they are planted outdoors or indoors. For indoor plants, the containers should move to a place that gets a lot of light, but not direct sunlight. A windowsill is a very good location if the sunlight is blocked to prevent burning leaves. The roots of the indoor plants will begin to grow out of the bottom of the container within 4 weeks after planting. At this point, you should transfer the plants to larger individual pots that are 5 inches deep. Tomatoes are not only one of the most popular foods in the world, but are among the healthiest as well. Many people enjoy growing their own tomatoes in their gardens considering that homegrown tomatoes are highly nutritious and flavorful right off the vine. One tomato plant can produce up to 10 pounds of fruit and there are different varieties of tomatoes to grow. Watering tomato plants frequently is very important for a bountiful harvest and healthy plants. When planting tomatoes, there are three major conditions to consider. A good location with Sunshine is essential. Next, the soil needs to be prepared at least two weeks before planting the tomato seeds. The best way to prepare soil is to dig it and add natural compost and organic matter and frequent watering for moisture. The third condition to consider is temperature because tomatoes cannot withstand frost and cold. When the weather gets cold, the plants should be covered. The temperature of the soil must stay above 10 degrees Celsius or 50 degree Fahrenheit. It is recommended that the best time to sow tomato seeds is late March or early April or 4 weeks after the last appearance of frost. In about 7-10 days, the seedlings will begin to grow whether they are planted outdoors or indoors. For indoor plants, the containers should move to a place that gets a lot of light, but not direct sunlight. A windowsill is a very good location if the sunlight is blocked to prevent burning leaves. The roots of the indoor plants will begin to grow out of the bottom of the container within 4 weeks after planting. At this point, you should transfer the tomato seedlings to larger individual pots that are 5 inches deep. squeezing the sides of the pots and turning them upside down. The soil ball needs to be pulled apart to separate the root-balls of the seedlings from one another very gently. The seedlings should be planted in the new containers with holes poked in the mix. Make sure the mix is firm around the seedling and water it quickly. These pots should be placed in bright light, but not direct sunlight. You should feed the seedlings each week with fertilizer and water frequently without overly watering them. The tomato plants will be ready to transplant outside after 7 weeks of growing or when they’ve reached 6-7 inches in height. But first, they should be “hardened” by taking the plants outside during the day and gradually for long hours until ready to be left overnight. To transplant, holes must be dug in the ground in a location that has a lot of light. The plants should be set 12 to 24 inches apart depending on the variety and should be planted deeply. When transplanting, do not disturb the roots and place the plant in the hole and fill with more soil. You may also loosely tie the stem of the plant to a stake with twine for added support or use cages for protection. Support stakes and cages should not harm the roots. Plants should be fertilized on a regular basis and watered frequently to avoid dryness, cracking and splitting of the fruits. Pruning is important to maintain healthy plants. Tomato bush plants, or determinate varieties, do not need much pruning but dead yellow leaves should be clipped to prevent decay. Upright tomato plants, or indeterminate varieties, will require pruning when you first notice the fruits beginning to form. 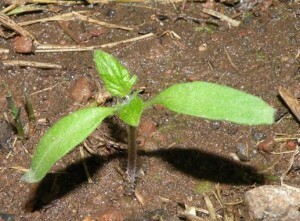 At this point, the plant will have small shoots or suckers in between the leaf stems and main stem. The best amount of trusses to keep on your plant is 8-9 and you can remove the others. To remove these shoots, pinch them with your fingers because most of these do not produce tomato fruits. Some of them can remain to add shade. Once your plant has 8-9 trusses, you can break the growing tip of the plant for more growth. To ensure a successful harvest, always water the plants, control the temperatures and maintain any pest problems. Tomatoes have plenty of health benefits and are one of the easiest vegetables to grow in a garden.